The biggest retail hack in U.S. history wasn’t particularly inventive, nor did it appear destined for success. 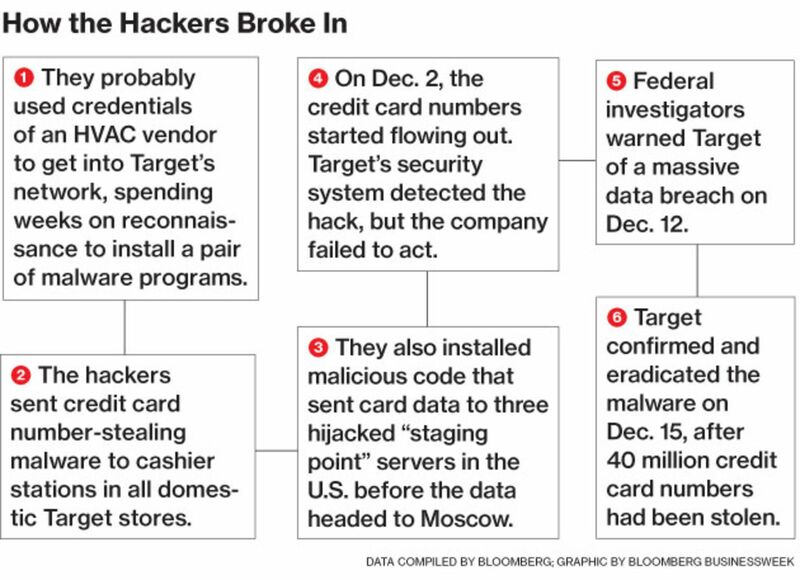 In the days prior to Thanksgiving 2013, someone installed malware in Target’s security and payments system designed to steal every credit card used at the company’s 1,797 U.S. stores. At the critical moment—when the Christmas gifts had been scanned and bagged and the cashier asked for a swipe—the malware would step in, capture the shopper’s credit card number, and store it on a Target server commandeered by the hackers. More than 90 lawsuits have been filed against Target by customers and banks for negligence and compensatory damages. That’s on top of other costs, which analysts estimate could run into the billions. Target spent $61 million through Feb. 1 responding to the breach, according to its fourth-quarter report to investors. It set up a customer response operation, and in an effort to regain lost trust, Steinhafel promised that consumers won’t have to pay any fraudulent charges stemming from the breach. Target’s profit for the holiday shopping period fell 46 percent from the same quarter the year before; the number of transactions suffered its biggest decline since the retailer began reporting the statistic in 2008.